Set the mood lighting, change out the linens, light the candles…. voila! Planning a wedding is a lot of work, we know! You have to make so many decisions that you don’t get to see until the day of. Imagining how all of the elements will work together can be quite difficult. But don’t worry, we’re here to help! When you’re picking centerpiece flowers, it is important to think about the ballroom. A few changes can make a big difference in the look and feel of the room. Coordinating your flowers to your wedding theme or colors can be a tremendous help in creating a cohesive style on your big day. The photo on the left show our centerpiece in a black and white themed ballroom. The romantic candle light adds ambiance. 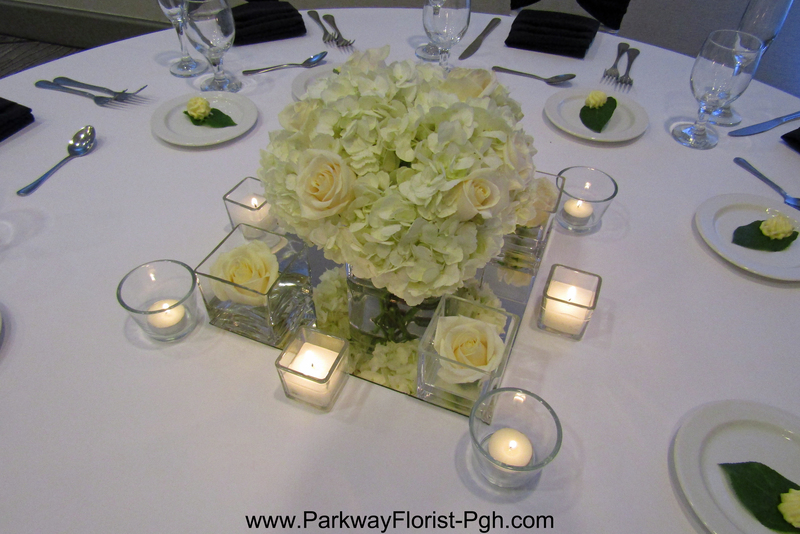 Accent roses placed in square votive holders setup on a square mirror give a contemporary and stylish look. The photo on the right features our centerpiece in a classic gold styled ballroom. Crisp white table linens with gold sashes and gold mercury glass votive candle holders create a classy and intimate feel. On the left, the black and white ballroom has a cooler, sleeker feeling. 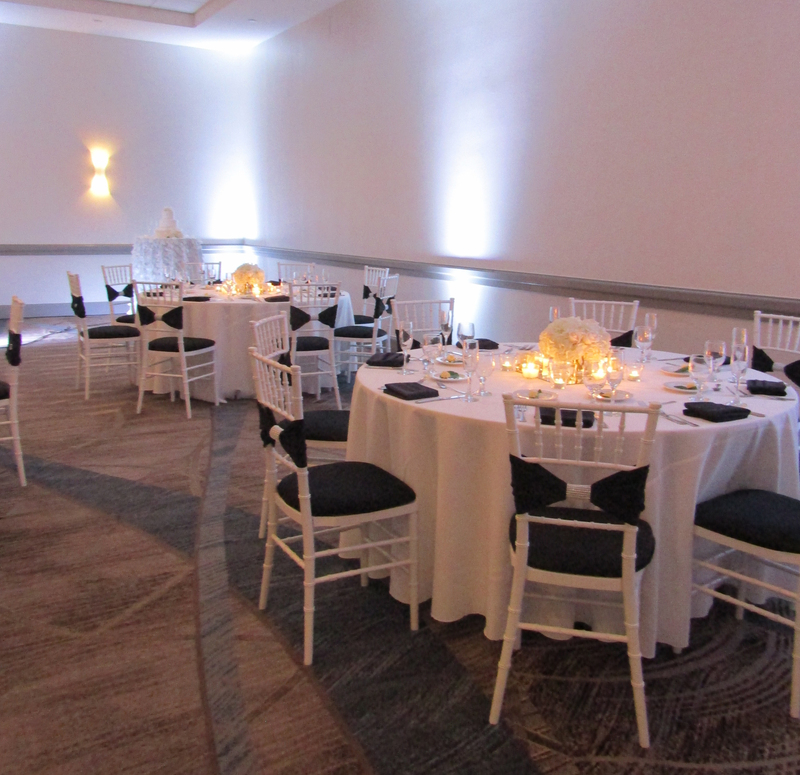 The white chiavari chairs create clean lines, and the black accents bring the look together. The same ballroom, styled in gold, on the right has a warmer color palette. 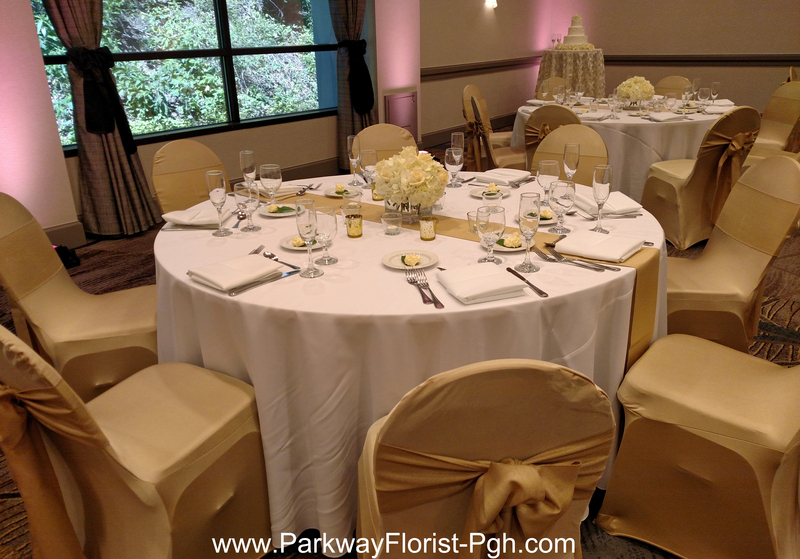 The gold chair covers and sashes bring a welcoming and comfortable atmosphere to the room. I was so fun to see this ballroom transform from one look to the other. Each time the centerpiece took on a new personality. With each bride we help, we love to see their personality and unique style shine through. This goes to show that the same ballroom can be styled an endless number of times for a unique and individualized look each and every time. We can’t wait to see many more looks at one of our favorite venues. 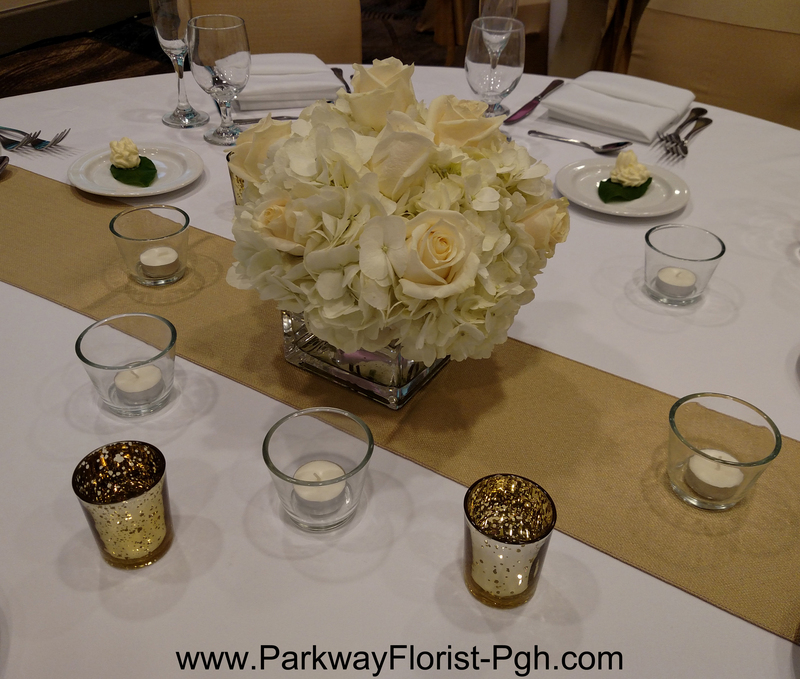 This entry was posted on August 16, 2017, in Ideas & Arrangements, Weddings - 2017 and tagged Black and White Wedding, Gold and White Wedding, parkway florist, parkway florist pittsburgh, parkway florist wedding flowers, Wedding Ballroom, Wedding Centerpieces, wedding flowers, Wedding Tables. Bookmark the permalink.